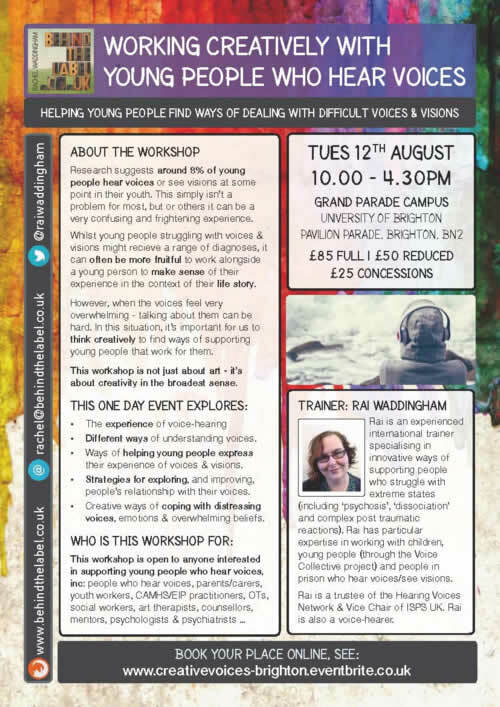 I’m really happy to be heading down to Brighton on 12th August to run a new workshop – ‘Working Creatively with Young People who Hear Voices’. This is a workshop that I’ve been planning for a year or so now, bringing together some of the practice tips I’ve learnt through working with young people at the Voice Collective project (and in my own journey towards expressing and dealing with my voices/visions). Research suggests around 8% of young people hear voices or see visions at some point in their youth. This simply isn’t a problem for most, but or others it can be a very confusing and frightening experience. Whilst young people struggling with voices & visions might recieve a range of diagnoses, it can often be more fruitful to work alongside a young person to make sense of their experience in the context of their life story. However, when the voices feel very overwhelming – talking about them can be hard. In this situation, it’s important for us to think creatively to find ways of supporting young people that work for them. This workshop is not just about art – it’s about creativity in the broadest sense. Different ways of understanding voices. 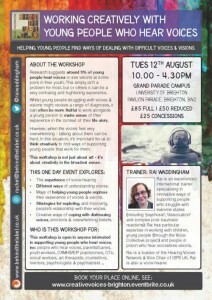 Ways of helping young people express their experience of voices & visions. Strategies for exploring, and improving, people’s relationship with their voices. Creative ways of coping with distressing voices, emotions & overwhelming beliefs. If you would like to attend, please book your place using the form below. You can pay by credit/debit card, invoice or on the door.